“One short sleep past, we take eternally, and death shall be no more; death, thou shalt die”. – John Donne. Life and death are the two entirely different concepts which have attracted the attention of many different scholars, thinkers, philosophers and writers to define and describe them. Many attempts have been made or undertaken to gloriously paint the picture of life under the same colour and shadow. Many patients and respirators who are suffering from the incurable diseases are not conscious and so cannot say, whether they want to live or die. Life has been considered as one of the precious gift that has been given by God to human beings. It is always a privilege to be alive on this earth and play a part in God’s eternal scheme. But there have been circumstances, when life becomes so difficult and unbearable that at one time person may wish to die or wished that he had never born. Under the jurisdiction of ‘Human beings’ the right to life is regarded is one of the most prominent right among all the basic rights enshrined in the Constitution of their respective States. It is equally important and true fact that however important the ‘life’ may be, it is the death which is the final destiny of every living creature on this world. 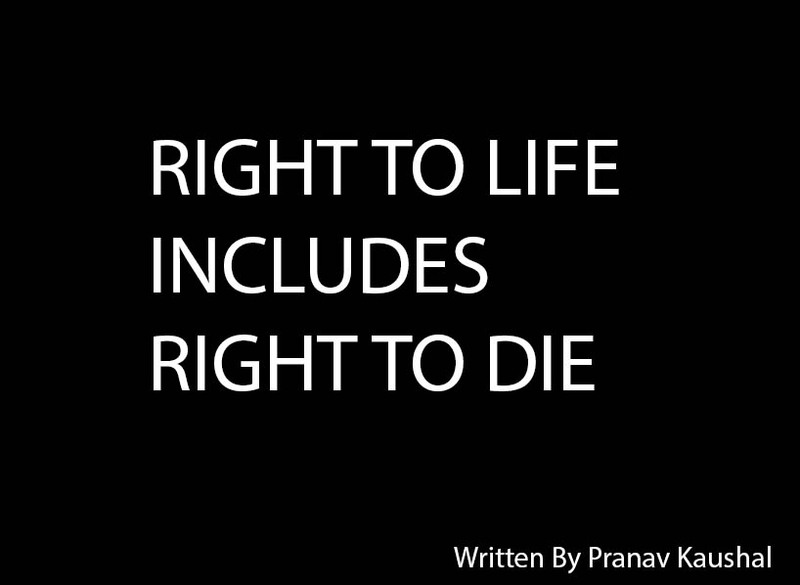 Thus, the question that arises that, ‘Does right to life include the right to die’? If right to live with dignity has been considered an integral state function, should individual’s decision to die, be protected from state intrusion? This question has been finally settled after the long debates and discussions on the point that, ‘Does Article 21 which includes right to life also includes right to die’ in Common Cause (A Registered Society). v. Union of India. The Constitutional bench in this case held that “Right to life including right to live with human dignity” would mean the existence of such right up to the end of natural life, which also includes the right to dignified life up to the point of death including a dignified procedure of death. The issue of “Right to Die” for the first time came before the Supreme Court of India in the case of P. Rathinam v. Union of India. In this case, Section 309 of Indian Penal Code which penalizes attempt to suicide was held to be unconstitutional as it is against the highest and one of the most prominent fundamental rights i.e. right to life and liberty under Article 21 of the Indian constitution. In this case, the scope of life has been widened as well as it was held that ‘right to life under Article 21 includes ‘right to die’. The Constitutional Bench in the case of Gian Kaur v. State of Punjab, scrutinised the reason and was of the opinion that if a person has right to live, he also has a right not to live. The court further observed that taking view on the fundamental rights dealing with different situations and right to do an act also includes not to do an act in that manner. Delving into the facet of committing suicides, the Bench observed that when a man commits suicide, he has to undertake certain positive overt acts and the genesis of those act cannot be included within the ambit of protection of “Right to life” under Article 21. It was held that the significant aspect of sanctity of life should not be overlooked. No stretch of imagination, extinction of life can be read to be included within the sphere of “Right to die” as part of fundamental right guaranteed under Article 21. “Right to life is natural right embodied and incorporated under Article 21 of the Indian Constitution but suicide is unnatural termination or extinction of life, therefore, incompatible and inconsistent with the concept of Right to Life”. The Court on adverting on the concept of euthanasia, observed that protagonist of euthanasia on the view that existence in persistent vegetative state is not a benefit to the patient of terminal illness being unrelated to the principle of sanctity of life or the right to live with dignity is no way going to provide assistance to determine the scope of Article 21 for deciding whether the guarantee of right to life includes right to die. The perception for the word “Right to life” never remains same at every stage of life. There comes a phase in person’s life when the spring of the word ‘Life’ is frozen, the rain of circulation becomes dry, the movement of body becomes motionless, the rainbow of life becomes colourless and the word ‘life’ becomes blurred and inevitable death comes near and more near to hold it as an octopus gripping firmly with its tentacles so that person “shall never rise up”.